BOHO MARKET: Handmade Goodies to Share! First of all, I wanted to thank you all for leaving your lovely comments on my first giveaway!! You're very supportive and fabulous! As you may know, besides my passion for fashion design, I also love arts and craft; I love to shop handmade, vintage, and one of a kind pieces. 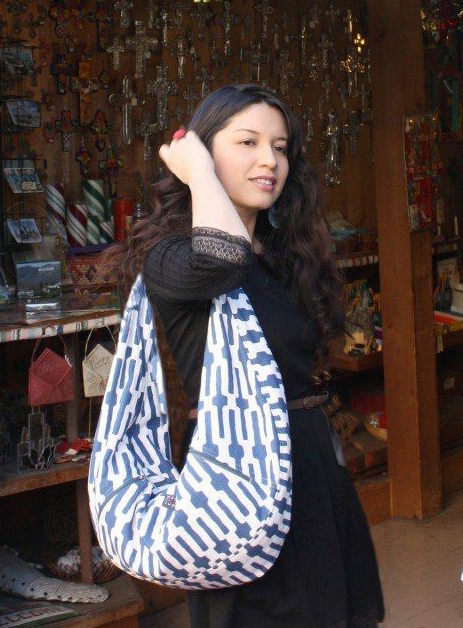 I appreciate handmade, that's why Independent artists, artisans, designers, are always very welcome on Boho Market! I made a collage of different pieces from very talented people, hope you enjoy them! Como ya deben saber, además de mi pasión por el diseño de modas, también me encanta el arte y las manualidades; me encanta comprar cositas hechas a mano, vintage o únicas en su tipo. Aprecio mucho las cosas hechas a mano, por eso los artesanos, diseñadores y artistas independientes siempre serán bienvenidos en Boho Market! Espero que les guste el pequeño collage que hice con diferentes productos de gente muy talentosa! 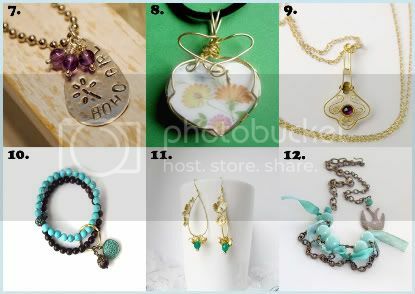 So many pretty, pretty, pretty, handmade things! You are so great to support independent artists!! I love them all... Tascha's paintings are really cool! love them all sweet one!! love the support you show to us creative beings!!! There are a few Marc Jacobs handbags that I wouldn't mind finding under my tree! i love the christmas spirit and the feeling of just being selfless & sharing the love! all these pieces are so cute, they'd make great christmas presents. thanks for sharing!! Cuántas cosas tan pero tan bonitas!!! En Navidad sólo espero poder un lindo momento en paz con mi familia!!! me encnata el nº8, es precioso! Giovannita! a mí también me gustan las manualidades y aquellas cosas que calificamos como "chucherias". Me parecen re lindaaas, mi favorito, aquella figura de la mujer con trencitas :) me hizo acordar a Frida Kahlo. Que de cositas!!! y todo muy original.. Such lovely items! :) I hope you are having a wonderful week. thank you for including my peace owl feather mobile with all this handmade goodness. so lovely! Oh, so many pretty things! I love it! Gi, can you give me your email? I want to make a proposal for you! 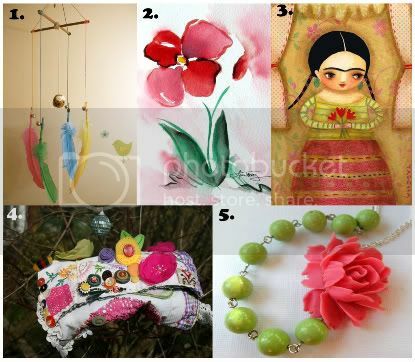 How lovely of you to post about all these handcrafted products! Thank you for including my broken china pendant. You're truly a loyal, faithful friend. Thanks for supporting handmade! I'm so excited you picked my lovely Boho Girl Necklace! You are such a sweetheart! Work is still super busy for me, but I hope to get some photos to you soon for my illustration!! I'm so excited to have you create an outfit for me!! Thank you so much for including my turquoise & wood bead bracelets - very much appreciated! Ohhhhh, how I love handmade gifts! Especially the high quality stuff you posted and so much of that is found on etsy. It's so hard to choose which gifts to purchase. I'm trying to get into the habit of making my gifts for the holiday. It's hard because I work everyday and when I get home, I'm usually spent after dinner and my workout. Oh well, I'll try to be ready for next year. Have a great evening, sweetie. Once again, you've shared great ideas. ayy ya kiero ver los resultados! uy my God!!!! te he dejado un premio en mi blog! pliss pasa a verlo!muchos besitos giovanna! These are all so lovely, but I think number 3 is my fave!!! So many beautiful pieces. I love the Silver Dog necklace! So many great things! I definitely plan to give some homemade treats this year. Chocolate covered pretzel sticks dipped in sprinkles! So easy and pretty. Pero que bonitas cosas pusiste en el collage!!!!! Todo muy mono, yo tambièn quiero pasarla lindo con la familia en esta Navidad creo que es lo màs importante! saludos nena y gracias spor pasarte por mi blog! Well, you are the sweetest!!! Happy Holidays to you Giovanna! How pretty! I tried to buy almost all handmade things this year. It makes the gifts so special. Me gustó la cadena con las cuentas azules, nº 12. Una preciosidad. Pero en general, todo lo que has puesto es bonito y apetecible.